SACRAMENTO, Calif. and BEIJING, CHINA /California Newswire/ — Kicking off California’s trade and investment mission to China, Governor Edmund G. Brown Jr. met with China’s Minister of Commerce Gao Hucheng today and signed a landmark agreement with the Ministry of Commerce to bolster economic ties and cooperation between California and China. The agreement, the first-of-its-kind between a subnational entity and the Ministry of Commerce, establishes a joint working group that includes California, the Ministry of Commerce and leaders from six provinces—autonomous regions and municipalities directly under the central government—Jiangsu, Inner Mongolia, Shanghai, Shandong, Guangdong and Chongqing, representing more than 350 million people. The working group is the product of talks between the Governor and President Xi Jinping during his visit to California in February 2012. The two leaders identified a need for enhanced cooperation and communication between California and China to advance mutual interests in trade and investment. The Memorandum of Understanding (MOU) establishing the working group was signed at a ceremony attended by dozens of business and government leaders from California and China who met to discuss trade and investment opportunities. “You can be sure that over the next several years that this union will have been the beginning of a lot of creative energy and output and production that will improve the lives of millions of people,” said Governor Brown in remarks at the signing ceremony. The working group’s activities will include: a regular exchange of information, annual seminars on trade and investment cooperation, trade missions and the formation of strategic relationships between cities in California and China. The MOU also identifies nine key sectors for cooperation, including infrastructure, biotechnology, information technology, agriculture, energy, manufacturing, tourism, environmental protection and exhibitions. China’s Chamber of Commerce for Import and Export of Mechanic and Electronic Products and the Governor’s Office of Business and Economic Development will participate in the working group as representatives of the business community. The objectives of the Working Group are to expand trade and investment cooperation, strengthen communication, enhance trust, boost economic growth, and create jobs so as to implement the consensus reached between China’s Vice President Xi Jinping and Governor Jerry Brown when Vice President Xi visited the US in February 2012. The Working Group is, on the Chinese side, led by the Ministry of Commerce (MOFCOM), with Jiangsu, Inner Mongolia, Shanghai, Shandong, Guangdong and Chongqing as its members. The commerce authority in each of these provinces (autonomous regions and municipalities directly under the central government) will be responsible for the coordination. On the side of California, the member is the Governor’s office. The Two Parties will take in more members under appropriate circumstances in the future. China Chamber of Commerce for Import and Export of Mechanic and Electronic Products and the Governor’s Office of Business and Economic Development join the Working Group as representatives of business community designated by the Two Parties respectively. Other government bodies, chambers of commerce or business associations can be invited to certain activities. The Two Parties respectively designate the Department of American and Oceanian Affairs of MOFCOM, and the Governor’s Office of Business and Economic Development of the State of California as contact points for communication and information exchange, and recipients of any notice required to be given under this MOU. The Two Parties will set up an annual meeting mechanism in the forms of video conference or meeting in person. The time of each meeting will be decided by the two parties through consultation. • To organize delegations of entrepreneurs to attend economic and trade fairs held in China and the State of California. • To promote Chinese cities like Chongqing and Qingdao to develop strategic cooperation relations with California Cities like Los Angeles and San Francisco. This MOU will become effective on the date of signature. Either of the Two Parties may terminate this MOU by giving the other party in writing 90 days prior to the intended termination date. The Working Group mechanism referred to in this MOU shall work together with other established and future mechanisms between relevant Chinese provinces and the State of California. This MOU is done in duplicate in the Chinese and English languages, both texts being equally authentic. 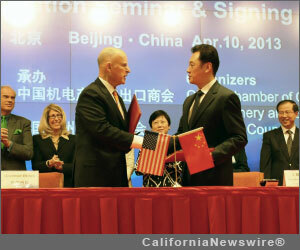 Governor of California, Edmund G. Brown Jr.
Nova Wang : Governor Brown Signs MOU with Vice Minister of Commerce, Wang Chao.